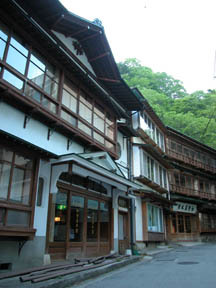 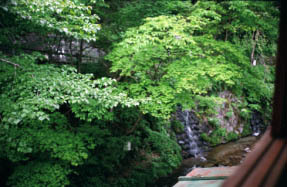 the green of the Yugawa ravine -- a deep forest -- the back -- a lodge wooden [ 3 stories of ] -- a few is left and there is an annex. 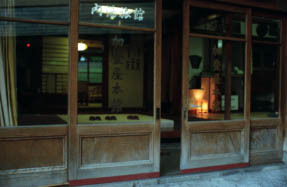 Real appearance, a main building Entrance. 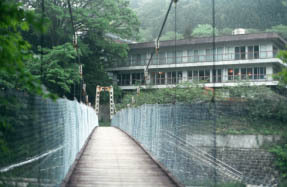 An annex and the Nakagawa suspension bridge. 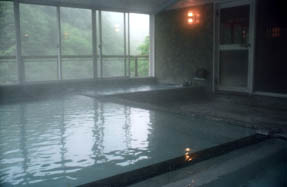 The hot water of an annex bathroom, souce-of-spring overflow, and a normothermia is divided into three tubs, and is changing water temperature.